Editor’s note: This week in the three days leading up to Thanksgiving, we will feature three ideas for sides that you can pull together with a minimal amount of ingredients and little stress. Today’s second recipe is Pennsylvania Dutch baked corn. If you grew up in York, Pa., like me, then you grew up around a lot of Pennsylvania Dutch food. A lot of this stuff is not found elsewhere in the country, or even in parts of Pennsylvania away from Amish country. When I lived in Pittsburgh, I looked forward to family holiday visits because I knew there would be at least a few PA Dutch items on the table, and one of these was baked corn. Baked corn is actually a sort of savory hot custard, and to some it may seem a bit odd (like many PA German dishes). However, it is absolutely delicious, slightly sweet, and buttery. It is made with dried corn, a culinary treat that is not found outside of our region. 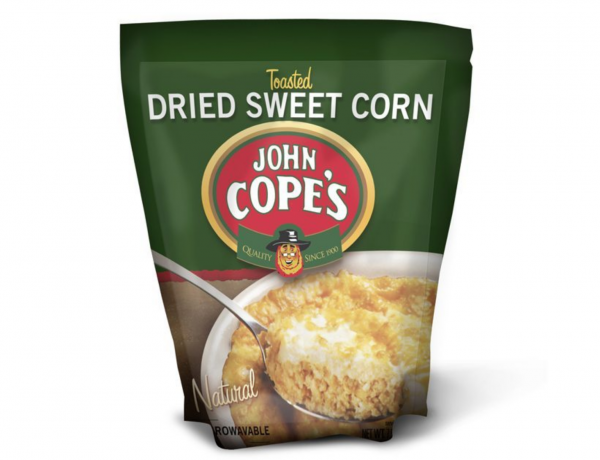 John Copes is the brand we used, and the cartoon Amish man on the package makes me instantly think of family Thanksgiving dinners. Dried corn’s flavor is a bit more intense than regular corn, and is best described as nutty. Plus, it’s very easy to make. If you can mix things together in a baking pan and put it in the oven, you can make baked corn. - In a large bowl, combine the ground corn, milk, butter, salt, sugar and eggs. Combine until all ingredients are well mixed. - Butter a shallow 2-quart baking dish. - Pour in the corn mixture. - Bake until set and golden brown on top, about 1 hour. - Let set for 10 minutes, then serve hot.